Dewalt Circular Saw Review DWE575 7-1/4"
Here we have the Dewalt DWE575 that is one of the best circular saws in its class; the 7-1/4-inch lightweight circular saw still delivers a powerful punch in a durable package. Weighing under 9 pounds coming in at 8.8 lbs. and measuring just 7.2 inches in width, its 15-amp motor cuts its way through the some of the toughest cutting applications around. A must-have tool for any toolbox arsenal for general contractors, remodelers, concrete formers, and framers, the DWE575 is perfect for exterior finishing, framing walls and cutting plywood, siding, and much more. The circular saw also delivers lots of versatility of depth and angle for many types of materials that range from wood to composite to metal. With a 2-9/16-inch depth of cut and a 57° beveling capacity (with 45° and 22.5° detents) lets users use various applications. A built-in dust blower keeps the operator’s line of sight clean of debris and sawdust for straight and smooth cuts providing enhanced accuracy. You’ll like how the DWE575’s high-grade aluminum base is durable, and that the shoe provides users with smooth movements and precise cuts, while the Anti-snag ball bearing lower guard not only delivers extra balance and control but also assists to prolonging the longevity of the circular saw. Its ToughCord cord system provides 3x more power and resistance to handling pullouts compared to standard circular saw cords. Even though the DWE575 is robust and powerful, its soft grip handles and trigger motor are easier and more comfortable for the user, so the production increases reducing downtime. Q - Does the circular saw have an electric brake? A - This model doesn't have an electric brake. 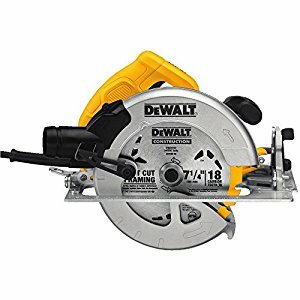 Q - Could I adjust the base plate to be parallel to the saw? A - It does tilt up and down. Q - Is there a left-handed version of this saw? A - No. Only right-handed. Q - Does it come with a blade and a rip fence? A - Blade yes, rip fence no. Q - Does it come with a hard case? These two saws are very similar aside from a couple of things. First, the DWE575SB adds an electric braking mechanism that stops the blade fast when the trigger is released. It also comes with a soft ergonomic black rubberized handle and a convenient contractors bag. Aside from that, the circular saws are the same tool. If you want the stop brake mechanism, then opt to buy the DWE575B for an extra $10 - $20. We feel that the DEWALT 15 Amp 7-1/4 in. Lightweight Circular Saw packs plenty of muscle power with its 15-Amp motor that can withstand some of the toughest applications you can throw its way. It's packed with features that will make your cutting experience quick and effortless. The DeWalt saw has a 2-9/16 in. depth of cut capacity for an incredibly versatile use and an anti-snag, ball bearing lower guard for smooth guard operation and extra durability. The clear line of sight provides users with blade visibility from any angle, and with the built-in dust blower, your line of sight is free of debris and sawdust for easier and more precise cutting. Perfect for using for DIY projects, job sites or any workshop projects, this saw is built to last for a long time. Check out: Best cordless circular saw for a cordless option. We also like how the DWE575 comes with a heavy-duty strain relief on its power cord called the ToughCord system as we constantly use our tools in a way that works for us, which means raising and lowering the saw by its cord which is a no-no but sometimes it needs to be a yes-yes. Having the ToughCord it can be done without ruining the cord.